Fear of visiting the dentist is the number one reason patients in the UK fail to make dental appointments. There are many causes of that fear, but for many people the noise and sensation of the dentist's drill is the biggest fear factor, meaning they fail to seek treatment until a painful emergency arises. For others, the fear of dental injections puts them off. Modern dental techniques have advanced greatly, and it is now possible to treat early tooth decay without the need for either needles or drills. 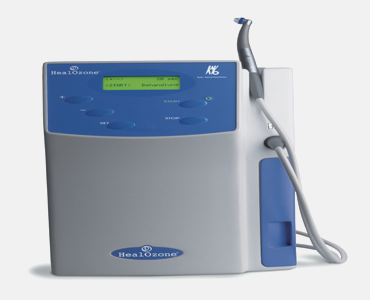 Many patients may think that's too good to be true, but at Forest Dental we pride ourselves on being the only practice in the area that uses the Healozone device to remove decay. Healozone uses ozone gas to remove the bacteria that cause plaque (and thus tooth decay) from your teeth without the need for a drill or an injection. Treatment with Healozone makes the teeth stronger and more resistant to decay; as well as removing bacteria it adds minerals to the teeth, which helps to keep the tooth enamel healthy. The treatment is fast and entirely painless. It takes approximately 30 seconds for the ozone produced to kill bacteria, and is a very gentle procedure. It is suitable for patients of all ages, both children and adults. Ozone gas is formed from oxygen particles and is an entirely safe treatment. Because nothing but the gas comes into contact with the teeth the treatment is completely pain-free, which makes it ideal for children and for nervous or dental-phobic patients, along with those who may have had a bad experience at the dentist in the past. Using the Healozone machine is part of our commitment to gentle dentistry. We are the only practice in Essex to offer Healozone treatment, which is licenced to treat early tooth decay, mouth ulcers and cold sores. We'll be happy to talk to you in more detail about treatment with Healozone – just contact the practice for more information and to book an appointment.